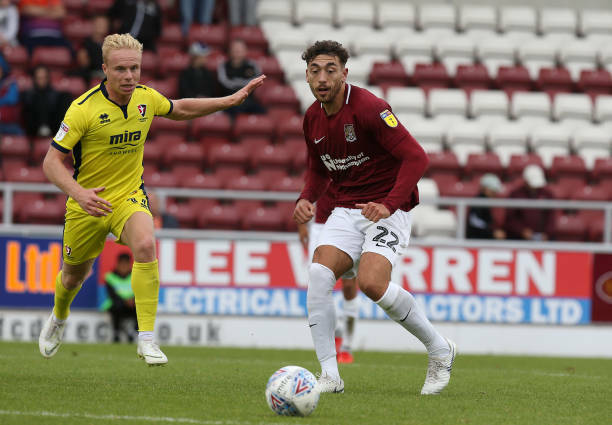 Welshman Ryan Broom returns home this evening when he plays for Cheltenham Town against home city club Newport County at Rodney Parade (7.45pm). The former Bristol Rovers player says: “I made my Football League debut at their ground. “I was born in Newport, but live outside in Blackwood. Initially, I joined a development centre in Newport and that was run by Bristol Rovers. The visiting Robins also include former Cameron Pring, a 21-year-old Bristol City defender who has had loan spells with Merthyr Town, Newport County and now home town club Cheltenham. Cameron Pring in action during a loan spell with Merthyr Town. Now he plays fro Cheltenham. Pic: Peter Harman. Newport should welcome loan signing Ben Kennedy back after injury, but Matty Dolan, Andrew Crofts and Fraser Franks are still ruled out. County will hope it’s third time lucky on Friday when they host Cheltenham. The Exiles have already suffered defeat against the Robins twice this season, in league and trophy. 🎥 We've faced up to tonight's opponents Newport County twice already this season, winning 2-1 in our previous league meeting and on penalties in the Checkatrade Trophy. County’s League Two fixture against Oldham Athletic has been rearranged after four Latics players were called up for international duty. Oldham will now visit Rodney Parade on Tuesday, April 30 (7.45pm). Supporters who have already purchased a ticket for the fixture will be able to use them on the new date.